Castle Campbell is one of my favourite Scottish Castles. 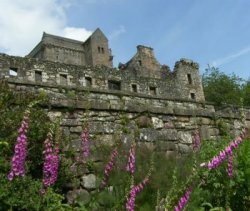 A couple of miles from the town of Dollar, on a high spur of the Ochil Hills, in one of the grandest situations enjoyed by any castle in Scotland, stands Castle Campbell. The only approach to it is up the bed of the burn, through a narrow cafion of tremendous depth, across dizzy chasms on narrow bridges, and finally up a stiff climb by the side of tumbling waterfalls. The ascent is difficult and arduous even now, after the way is smoothed as well as may be for the tourist. What must have been the prospect for the enemy who tried to compass the attack of the castle against a determined defence! The castle stands on a green promontory between the two streams, known as the Burn of Sorrow and the Burn of Care, and its original name was the Castle of Gloom. The mound on which it stands is partly natural and partly artificial, and at least three hundred feet high. On the side toward the hills was formerly a deep chasm, spanned by a drawbridge; but this is now partly filled up, so that the ascent on this side is not more than fifty feet. In such a situation, before the advent of artillery, an attack on this castle would have been perfectly useless. No engines could have been brought to bear on it, and a handful of men on the parapets could have resisted an army as long as their provisions held out. The castle comprises a keep and enceinte of the fourteenth century, to which have been added buildings about the walls of the enclosure. The keep is a simple rectangle, twenty-eight by sixteen feet inside, with walls about eight feet thick. The original entrance is on the ground floor, and the hall floor is reached by a wheel-stair. The upper rooms are reached by another stair in the opposite corner, a most unusual arrangement. The keep has three vaults, the upper one cut in two by a wooden floor midway of its height. The dungeon in the ground floor is six and a half by three feet, and reached only by a trapdoor from the hall; truly, a desirable place to be imprisoned in! The later buildings comprise ranges on both east and south sides. Those on the south were lighted by numerous windows cut in the south wall, and are therefore of comparatively late date. They comprised a row of vaults in the basement, and a large hall and private rooms above. The east wing contained private apartments. A new staircase here gave access to both the east wing and the keep, and two more angle turrets on the south side also carried staircases. The porch on the east side is an excellent piece of work. The gateway and gatehouse are late work, as is proved by the gun-holes for defence. The name of the castle was changed to its present designation by act of parliament in 1489, at the request of its proprietor, the first Earl of Argyle. It was destroyed in 1645, when the MacLeans and Ogilvies, the fierce allies of the Marquis of Montrose, carried fire and sword through all the Argyle territories. It is now open to the public, and kept in good repair. Castle Campbell Hotel, 11 Bridge Street, Dollar FK14 7DE, Scotland. Find the best deal, compare prices and read what other travelers have to say at TripAdvisor.